Do you love bold strong colors? In discovering what is so compelling about the play of one color against another, we find much of it is in the value. The grey solids have all of the value and so retain much of the drama of interaction associated with the bright colors. This will be a color play class where we examine the relationship between color combinations and their greyscale counterparts. Students will experiment with color groups and greys to learn the power of value in color combinations and the potential of combining greys and color in tandem. We will do a series of exercises in solid fabric with color and greyscale palettes. Interested? Join NJMQG on Saturday June 1st for Playing with Color and Greyscale taught by Sarah Bond. The workshop will be from 9:30 am to 4:30 pm at the Community Church of Cedar Grove, 65 Bowden Rd. Cedar Grove, NJ. Sarah Bond comes from a family of quiltmakers stretching back to the early 19th century. She has been quilting since her early twenties and loves immersing herself in old quilts and quilt books, looking for new ideas. She is obsessed with color and pattern and while her inspirations are classic and traditional, she renders her own work with a modern or contemporary flair. She loves nothing better than being in a room full of quilters because the creativity that is generated is so intoxicating. Her mission when teaching is to break quilts down to their components to demystify them so that students can master those components, bend them to their will and design their own masterpieces. WHEN: THURSDAY, April 18, 2019 AT 7:15 PM. Doors open at 7 pm. None this month, but we wish a Happy Passover or Easter to those who celebrate; and encourage everyone to do something to benefit the planet (or at least your own little bit of it) next week in honor of Earth Day. On May 1, thirty-eight of us will receive the first installment of instructions for our 2019 Mystery Quilt. I’m already looking forward to Show and Tell in December! See you in Caldwell Thursday evening! We had a lovely tea party at our meeting last month. Thanks to Terri and Barbara for setting it up. (And another special thanks for all your work on the holiday party) And to Margy for your water pots. We had 46 members and 2 guests join us for the meeting. Welcome to Kate, April, Carmen and Raquel (forgive any mispellings). We started out with some updates from members about what they’ve been doing or what’s coming up. National Quilt day was celebrated. We had 8 at Margy’s and 9 at Jackie’s house sewing away. We also had our Charity Sew-in. We are always interested in what techniques you want to learn or who you’d like to have teach. Two suggestions, Yvonne Puchs (quiltingjetgirl) an Lee Chappel Monroe. Let us know if you have any other ideas! Quiltcon happened and we got a lovely slideshow of pictures from some members. Unfortunately seems like the weather wasn’t the greatest, but looks like plenty of fun, and more importantly, beautiful and inspiring quilts, was had! If you’d like to see more of the quilts, someone suggested the Eventscribe App for Quiltcon. If you check out under posters you can see more. 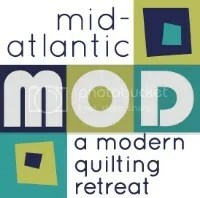 We also had a couple of members mention the Modern Sewciety podcast to check out. and Elaine was next with 22. Way to go! Don’t forget to keep sewing up pillowcases, blocks, kits or anything your heart desires for charity to lovingly donate to those in need. Our programs ladies are always hard at work. Crista and Jackie have got a Mystery quilt starting soon, and a good looking schedule through the rest of the year. At the April meeting we will be doing an April Fool exchange. Bring in an “ugly” FQ to be magically transformed. The April meeting will be at our alternate space due to our space being unavailable. The meeting will be April 18, 7:15 at The Church of Latter-Day Saints 209 Mountain Ave, Caldwell, NJ 07006.